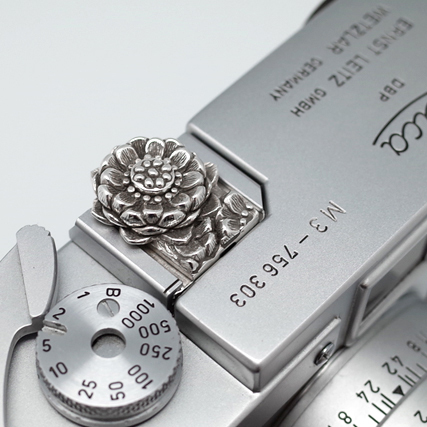 Unique hand crafted special jewelry for Leica cameras "Japanese beauty presented to the world" by JAY TSUJIMURA.
' Floral emblems of Japan' : Sakura and Kiku soft release buttons. When you take a walk with your camera, the world is seen with new eyes. As your finger touches this jewelry you are inspired to see a new kind of beauty. When you least expect it, on a back street or alley, in the mountains, on the beach, or in the heart-of the bustling city you rediscover the beauty surrounding you. Time to discover a new tradition. Sakura cherry blossom 'Spiritual beauty', 'Nobility'. These flowers are crafted with natural simplicity, grace and beauty. A sense of organic warmth entwined with elegance that can only be achieved by hand. Not only stylish but also a natural, ergonomic fit and feeling. Easy to grasp so you don't lose that shot. JAY TSUJIMURA lived in the UK and USA, between 1988-2004, immersed in western culture so far removed from Japan. After returning to Japan, he became inspired by the Japanese esthetic. The culture, the nature, the food, the people. It's with these feelings that JAY TSUJIMURA creates his art. 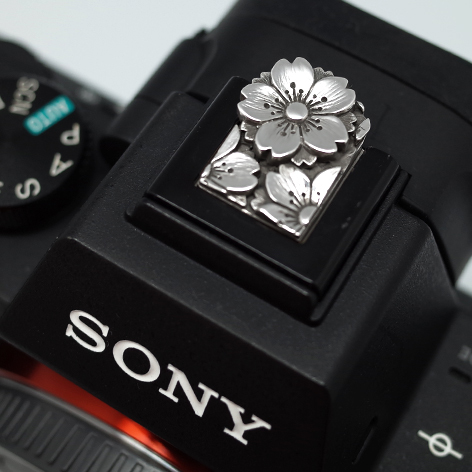 Enjoy "Floral emblems of Japan" collection!